There is a quiet revolution happening in society. Quiet because it is rarely discussed among people or politicians, and it is seldom reported on by the media. Revolutionary, because it is about to cause the most radical change ever envisioned in the way society operates. Over the course of the last generation, the rich and powerful have been waging a war on cash and slowing steering the world away from tangible paper money and coins to plastic cards and ultimately to digital alternatives to cash. This change has occurred over the same time frame that microprocessor technology and global electronic networks have combined to make the dawn of digital money possible. This trend to eliminate cash has not happened by accident, but by determined design. The march toward a cashless society has been carefully planned and carried out in stages. Over the last decade it has been pushed forward at an accelerated pace. The war on cash is designed to eliminate all traditional money from transaction systems, and this even means eliminating personal cash transactions between individuals. It represents a dire plot that has been instigated within the highest levels of the banking and financial institutions. It has also been done with the full cooperation and support of government leaders from around the world. Many countries are now phasing out cash payments by passing laws limiting how much cash can be used for a given transaction or by outlawing denominations above a certain amount. The European Union has an official initiative to restrict payments in cash (ref.). The EU is also looking to limit transactions by people using unofficial digital currencies like Bitcoin (ref.). The war on cash and the subsequent cashless society that it will inaugurate will be in reality a surveillance monster that will take away our freedoms and threaten every aspect of our lives. The vast majority of people remain oblivious to its rise, and they are also nearly powerless to stop it. When the new cashless society is finally unleashed upon the world, we will completely lose our financial freedom in ways never before thought possible. We will in effect be turning financial control over to a relatively small group of global oligarchs, who don’t have our best interests in mind. Sweden was one of the first countries to restrict cash payments and move to a smart card based system. Most banks in Sweden now refuse to do business in cash, and most other businesses have followed suit (ref.). Paper money and coins represent less than 3% of Sweden’s economy. As a result of eliminating so much cash, robberies have dropped precipitously and tax revenues have increased, because unreported cash transactions are more difficult to carry out. Unfortunately, the incidence of cybercrimes has increased dramatically right along with the elimination of cash, as electronic fraud has become a constant threat. Eliminating cash will also drive the need for greater electronic security and the need for establishing positive identification for each person making a transaction. This is where the combination of the Mark of the Beast and biometrics will soon become the method of choice. If you haven’t heard about this war on cash, you will soon, because it is about to affect your checking and savings accounts as well as your wallet in very real ways. No longer will you be able to maintain a safety net by keeping a cash stash of extra money in case of emergencies or disasters. 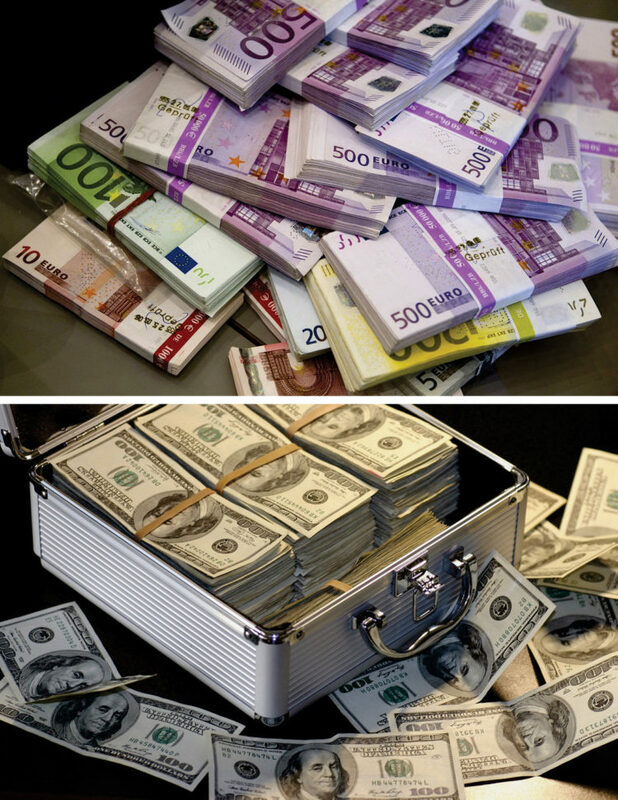 Cash stored in drawers, mattresses, or safes will become worthless, as all cash transactions will be made illegal through government decree. The banks too will refuse to accept cash in any form and will only accept digital deposits and withdrawals. Other countries in Europe are following Sweden’s lead to eliminate cash, such as Norway, Denmark, France, and Spain (ref.). The retail and food industries will quickly follow suit and stop accepting cash at their registers. Large retailers like Walmart will be at the forefront of this transition, just as they always have been when new methods of digital purchasing become available. In addition, the ability to buy or sell privately will also become a thing of the past, because every transaction will need to be digitally recorded by the vast network of financial and government computers, which will electronically control your money and stipulate who can buy and sell. Perhaps no country has made such sweeping changes in their economy as India. By early 2017, Prime Minister Modi had removed from circulation 86% of his country’s currency (ref.). He supposedly did this in an attempt to eliminate tax evasion, corruption, and shut down the so-called shadow economy. According to reports, tax revenues in India are up 14.4% due to the switch to cashless payments, which create exact electronic records that tax cheats can’t overcome. Almost 2,000 years ago, the apostle John had a vision that actually foresaw a global cashless society arising in the Last Days. While being held prisoner on the island of Patmos, John wrote down a number of prophetic visions, which ended up being called The Book of Revelation. In one of them, he saw the final world empire arising out of a chaotic sea of nations (Rev. 13:1-4). He then saw the dynamic leader of that empire rising to power and making a radical decree, which stipulated that from that point forward traditional money could be no longer be used, but instead all buying and selling would be done through the use of a special Mark on a person’s body (Rev. 13:5-18). CNN Money reported in January of 2017 that India is planning to possibly eliminate credit cards, debit cards, and ATM cards by as early as 2020 and go entirely towards a biometric-based financial system (ref.). As of August 15, 2017, a total of 1.171 billion out of India’s 1.3 billion people have registered their biometric data with the government’s identification authorities (ref. ), so this plan is not so far fetched. The Unique Identification Authority of India (UIAI) administers this extensive biometric program, and they will also be the ones managing the coming cashless economy. John predicted that in the Last Days commerce would be permitted only for those who obtained a Mark in their right hand or forehead. However, what most people often miss in this prophecy is that the Mark will be used in conjunction with two other important requirements: a person must have the name of the Beast and the number of his name. The Beast in this prophecy is the empire, and it consists of all the people who are citizens of it. This means that each individual who is a part of the empire will have his or her own unique name and number, along with the Mark, in order to participate in society. This is very significant to understand, because in our current digital economy we now realize that without the use of a unique identifying name and number associated with each person, modern commerce would not be possible. Any thought of instituting a fully cashless system without names and numbers to establish identity would also be impossible or fraught with fraud. In fact, it is clear that the use of the Mark alone would never be enough to move the world to a cashless system of buying and selling. This is because a simple mark can’t provide any way of associating a desired purchase with an individual’s identity and purchasing power or the available funds in an account. Think about it. If someone attempted to use the Mark alone for purchasing, there would be no way of knowing whether the person presenting the Mark had enough funds to pay for what was being bought. It’s obvious that there must be more than just a Mark involved to create the cashless system of commerce predicted for the End Times. There are also several additional technologies that have been developed in our generation that are helping to pave the way for the fulfillment of John’s prophecy in Revelation. These are all high technology inventions, which have come to maturity and have been commercialized over the last few decades—in other words over the same time frame that the war on cash has occurred. 5) the marking of all products with a scannable digital barcode containing an identification number having a pseudo ‘666’. These developments are all forming the basis for the final cashless society that will be forced upon everyone at the rise of the Antichrist (for additional information, see the sections under Mark of the Beast and 666). DO NOT GET THE MARK OF THE BEAST!